Using bookmarks is an easy way to access your favorite web pages. Basically a bookmark is a shortcut to web resources. Every Internet browser allows you to save visited pages and links so that the next time you want to visit them you could do so quickly by just clicking the bookmark. Using bookmarks eliminates the necessity of typing addresses manually in the browser's address bar. By managing bookmarks you can quickly access your favorite web pages and save time. 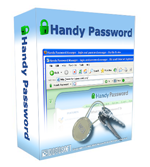 In Handy Password, password management software is combined with a password manager. Handy Password bookmark manager not only manages bookmarks, but fills forms automatically. If you visit the page where you need to fill in a form, the form can be filled and submitted automatically while you have to do as little as to click a bookmark. Your bookmarks are located on the browser toolbar so all you have to do is to click them and enjoy the results. Moreover, Handy Password bookmark manager allows creating bookmark folders where you can keep groups of bookmarks. Internet users often visit web pages where they need to enter their identification information such as password and login. The most frequently visited pages include Internet accounts, blogs, forums, mail servers and so on. They all ask you to fill in login and password, however it can be rather annoying to fill in your login and password upon each occasion manually. A copy paste option can help, but it is still no good because you need to type your password first or to open the file where your password is stored. Handy Password bookmark manager will automatically download your favorite pages and fill in login and password fields. Improve the quality of your web browsing with Handy Password bookmark manager!